What images does the word “networking” conjure up for you? For some it’s a painfully awkward cocktail reception, making small talk with people you never plan to see again. For others it’s the obnoxious schmoozer who makes you feel used, fake and unappreciated all at the same time. 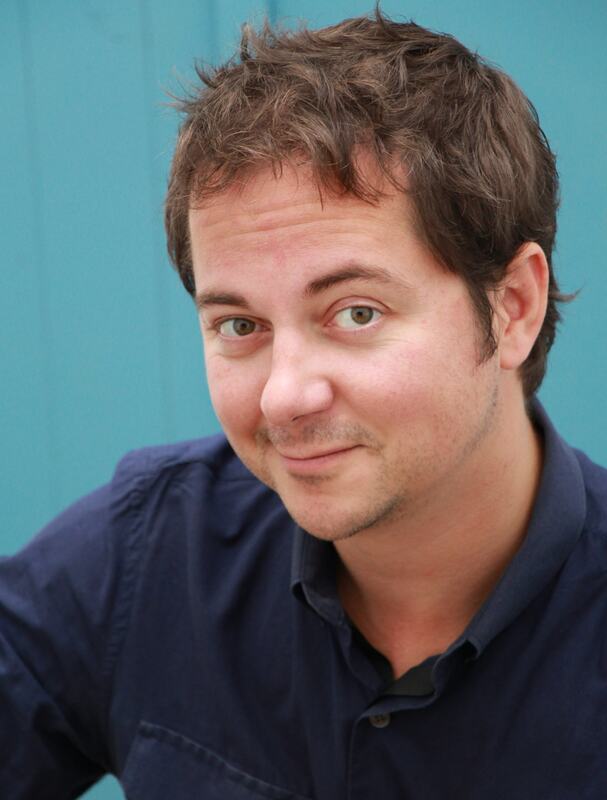 There are definitely some negative connotations about “networking” out there. For some people, though, thoughts of networking instills feelings of enthusiasm, compassion and a genuine desire to be of service. These are the people who get it. These are the people that understand that networking is not about “working the crowd” or seeing how many business cards you can collect in a 45 minute conference breakfast. These are the people who understand that networking is about connecting – about building genuine and lasting relationships with people for mutual benefit and enjoyment. As we’ve explored in past summaries, no one is capable of great and lasting success on their own. We all benefit from a wide circle of contacts – contacts from all walks of life – and they in turn benefit from their relationship with us. True networkers understand this, and bestselling author, Keith Ferrazzi, is one of the best networkers of our time. 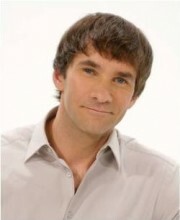 In his ground-breaking book, Never Eat Alone, Ferrazzi teaches you how to become a master connector, as well. "Contrary to popular business wisdom, I don’t believe there has to be a rigid line between our private and public lives." There is a common belief, especially among younger professionals, that public and private lives are meant to be kept separate. Truly effective networkers, however, understand that the opposite is true in building lasting, memorable relationships. Everyone you meet is, first and foremost, human. We all have hopes, doubts, passions and insecurities. It is on this fundamentally human level that we can best connect with others in a way that fosters connections. We need only to look to the recent popularity of Twitter, LinkedIn and Facebook for business and a myriad of other online mediums to realize that the line between public and private lives is blurring at an incredible rate. We are in a world of unparalleled transparency; transparency that can intimidate people who have something to hide, and liberate those who are authentically themselves, regardless of who they are with. "We can go through life, particularly conferences and other professional gatherings, making shallow, run-of-the-mill conversation with strangers that remain strangers. Or we can put a little of ourselves, our real selves, on the line, give people a glimpse of our humanity, and create the opportunity for a deeper connection. We have a choice." Be real. Too many people, too much of the time, hide behind bland conversation and social niceties. Unless you’re a meteorologist, when was the last time you had a memorable conversation about the weather? People are inspired and engaged by passion. So share yours, ask about theirs. Get into a real conversation with someone as quickly as you can and skip past all the boring, non-memorable stuff. Here’s the other side to the passion coin – vulnerability. Yes, vulnerability. Nobody’s perfect, no one knows it all. Be ok with that. People that pretend to know everything about everything come across as fake and untrustworthy. Your power is in being able to admit you’re still learning. If you can connect with someone on a shared passion and be strong enough to admit a vulnerability in some regard to that passion, you’ll have a deep and instant connection. Passion and vulnerability: two sides to the coin of authenticity. "Greg remained true to himself no matter whom he spoke with, but he delivered his message in a tone and style that fit that person best." A “Johari window”, as Ferrazzi describes it, is the general tone and energy level of the person you’re speaking with. You’re no doubt well aware that some people are naturally louder and more boisterous than others. Everyone has volumes, tones and speaking patterns that they are most comfortable with. You can instantly make people feel more at ease if you consciously dial back (or dial up) your energy levels to match their own. When people feel that you are operating on the same “frequency” as they are, they connect with you and feel more at ease. While the Insights above are specific tips on how to better connect with people, we would be doing Never Eat Alone an injustice if we didn’t clarify that this book is about so much more than tips on how to best relate to people. While it definitely offers valuable and practical insight on how to help people connect with you, Never Eat Alone sufficiently covers all the five W’s as well: Who, What, Where, When, and Why, and does so in an earnest and genuine way. 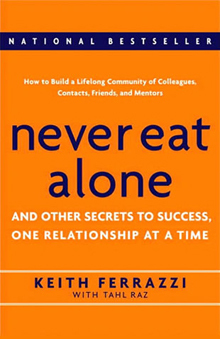 Keith Ferrazzi’s first offering to the printed world, Never Eat Alone, is a brilliantly engaging and insightful foray into the world of networking. Ferrazzi’s style is fresh and honest, his content thorough and backed by years as a successful connector of people. I love this book. It is truly a timeless classic, destined to be remembered alongside Carnegie’s How to Win Friends and Influence People, as one of the greats.